It was my pleasure to interview our friends at The Inspire Blog, about the Athena nesting tables. These tables are both stunning and stylish. We couldn’t wait to ask about the design and learn a bit more about the manufacturing process of these beautiful interior design pieces. 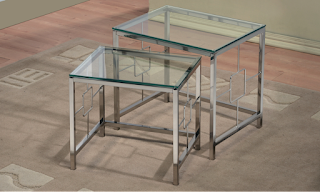 LonsDesigns: The Athena nesting tables look to be of a very high quality, both the base and the glass top. Can you talk about the manufacturing process? LonsDesigns: For those unfamiliar with nesting tables, in your opinion, what area of the home would they work best? LonsDesigns: Can the nesting tables and other pieces found on the Inspire now website be purchased online?